+254+[2 pages publisher's advertisements]. Small octavo (7 3/4" x 4 3/4") rebound in 3/4 leather with paisley boards. 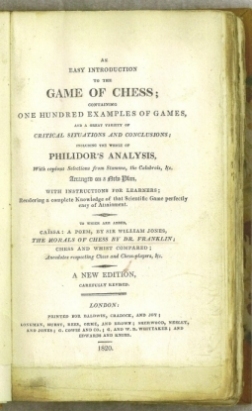 Contains Sir William Jones' poem "Cassia: or The Game of Chess, A Poem"; based upon Pratt's "Studies of Chess". (Van der Linde: 613) 5th English edition. 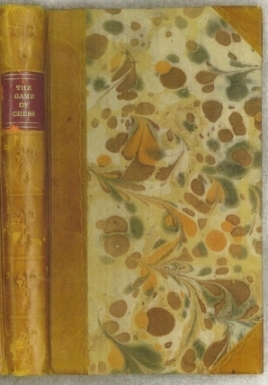 Rebound in decorative 3/4 leather with red spine label with gilt lettering, new end papers and paste downs, lacks frontispiece fold out chess board, else about very good.